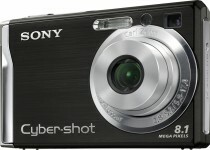 Over the past two weeks, Sony has announced their lineup of Cyber-Shot cameras for 2007. Each of the four camera series that were announced includes a unique specialty such as WiFi and internal storage. Unlike the last generation, all the new cyber-shots support displaying photos on full 1080 HDTVs using component cables. In addition they all now use a whole new GUI and support even support editing photos within the camera. 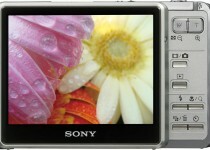 Sony’s first WiFi-enabled camera allows wirelessly sharing photos with other cameras and computers. 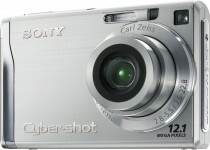 The cyber-shot features a high-res 3.5″ LCD display, 6 megapixels, 3x optical / 6x digital zoom, and a new interface. The unit accepts Memory Stick Pro Duo media, but has 2GB of memory built in. (~600 full resolution pix) The G1 will begin to Ship in April 2007 for $600. 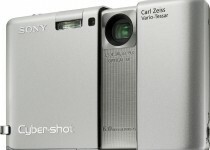 The T100 features a 5x optical zoom and a 3-inch LCD while the T20 has 3x optical zoom and a 2.5-inch LCD. Both cameras are 8 megapixels and support outputting the images to HDTVs via component cables. Both cameras have a new “face tracking” technology to allow detecting faces and automatically adjusting multiple settings for a “perfect” image. The T100 will be available this month for $400 and the T20 in April for $330. 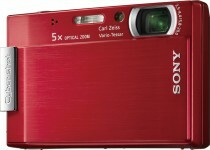 The W200 has a whopping 12.1 megapixels, a 3x optical zoom, and 2.5 LCD display while remaining under an inch thick. Both the W90 and W80 have the same features except they are 8 and 7.2 megapixels, respectively. All 3 support 1080p HDTV output, face tracking, and auto focus. 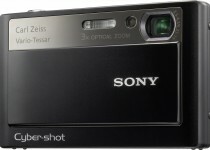 The “alpha” SLR technology allows photos to be taken in 1sec intervals. The W90/W80 are available now for $300/$250. The W200 will be available in May for $400.